I can’t help loving soups and congee. Especially when the weather turns cooler and I’ve been nursing a bout of bronchitis. I’ve been on a steady supply of sugar-free lozenges and I’ve had enough of it. I needed something to soothe my wobbly tummy and yet have strongish flavours since I seem to have lost my tastebuds with all those lozenges. The Instant Pot is a warrior. I could easily have made the congee on the stove as well but I could do it just as well in the Instant Pot and walk away from it. No prolonged stirring and tending to the stove, which gave me more than enough time to hack and cough miserably in a corner. But seriously I must be slightly better that I’m actually thinking of food right now. This whole exercise was also semi-intentional as I do have some frozen seafood in my freezer which I thought was long overdue for clearing. I had frozen oysters (from my oyster omelette obsession phase) and both dried and frozen scallops. So both these constituted the seafood part of this loaded congee. I made pork balls (nothing like homemade ones) and also added tofu beancurd for protein content. 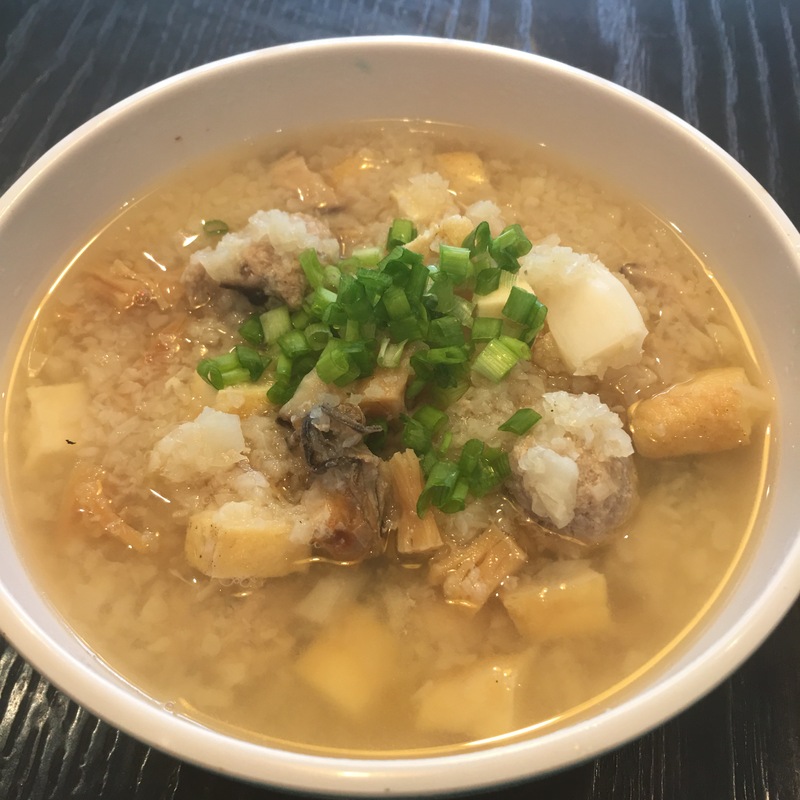 If anybody is trying to replicate this seafood congee, the ingredients can always be adjusted to include things like fish or shrimp in the congee, and the frozen scallops and oysters can certainly be substituted for other kinds of seafood. This kind of congee is kind of loaded – but there is a variety of congee some Chinese kitchens specialize in – packed full of all kinds of ingredients to make a nutritious power-packed meal. These often contain odd combinations like cuttlefish and peanuts or fish, seaweed or ginkgo nuts. Recipes of this kind of congee are not so common as most Chinese congee recipes tend to be much simpler. I suspect however that this very loaded type of Chinese congee belong to a Chinese soup tradition that comes from generations past of frugal housewives who don’t want to waste bits of leftover ingredients in their larders. This bout of illness reminded me how during illnesses, insulin seems to turn into water and the body for some reason becomes very insulin resistant. Fighting the bug for me includes managing the diabetes monster that rears up its head at the most inopportune moments, and it was all the more important for me to keep as low carb a diet as possible during this period. Instead of rice porridge, cauliflower is a great substitute and also lends a kind of sweetness to the soup. In the end I think this steaming bowl of cauliflower congee has ticked off the boxes for being a healing meal. Put the dried scallops, kombu and water into the pot. Put on manual high pressure cooking mode for 20 minutes. In the meantime, prepare the meatballs. Soak the mushrooms in hot water, and when rehydrated, chop finely. Mix the pork, mushroom, cabbage, garlic and soy sauce, sesame oil, fish sauce and white pepper together. Form 1-inch diameter balls with the pork mince and set aside. When the stock is done, do a quick pressure release. Remove and discard the kombu. Use a ladle to break up the dried scallops into shreds. Add the cauliflower, oysters, porkballs into the pot. Seal the Instant Pot again and put on high pressure for another 10 minutes. When done, do a quick pressure release. Put on sauté mode. Stir in the beancurd and thawed scallops into the congee and cook for about 2 minutes. Serve hot with a sprinkling of spring onions on top. Hey. Was searching for low-carb congee and your page came up twice; once for this and the other for the pei dan jook 2 yrs ago. To be honest, I pretty much only like the Canto congee. I was wondering whether adding almond flour and chia seeds to thicken the soup would make it closer in consistency to the real Canto thing while still keeping carb count low. Hi Phil, the reason why canto congee has that consistency is really starch from glutinous rice flour! I’ve not really tried the almond flour or chia seed ideas – do let me know how that works out. I do add almond flour into meatballs and the like; I suppose chia seed may give the gumminess of a congee – good thought!